The Mercedes CLA and CLA Shooting Brake has been facelifted for 2016. The interior has also received numerous enhancements, among them new seat covers and trim parts, as well as chrome-plated controls. Some items that were previously options on the CLA 45 4MATIC, such as the LED High Performance headlamps, now come as standard. All models now have a diamond radiator grille in black as standard, plus a new front bumper with a silver, black or chrome trim strip. The rear bumper is optionally available with a panel incorporating a trim strip in chrome or black (Night package) between the tailpipes. The tailpipe trim panels themselves are now integrated flush into the bumper. There is a new paintwork shade, cavansite blue metallic and the range of available wheels has also been extended. There is now a choice of five 18-inch light-alloy wheels including a new 5-twin-spoke design in conjunction with the AMG Line. This is available in two colours (painted black or titanium grey, with a high-sheen finish). As well as the seat covers and chrome-plated controls, a slimmer-looking freestanding 20.3 cm (8-inch) media display with a new-style glass cover is available as an option for the Audio 20 USB and Audio 20 CD systems. The new-style dials and red needles in the instrument cluster make it easier to read the instruments. New trim elements in ‘sail-look’ finish, matt black ash wood (in conjunction with Exclusive package), black Dinamica microfibre (optional in conjunction with AMG Line) or aluminium with honeycomb grain ‘liven up the interior’ says Mercedes. The design of the AMG spoiler lip on the boot lid is new, while further new exterior features of the facelifted AMG model include a new front apron in a new A-wing design with front splitter inserts in matt titanium grey and high-gloss black flics. The latter also help to improve the flow of cooling air. New at the rear is the design of the diffuser insert, with four vertical fins. An AMG Aerodynamics package is now available as an optional extra. This comprises a larger front splitter, additional flics, a black AMG spoiler lip at the rear plus spoiler lips over the simulated air outlets on either side at the back. 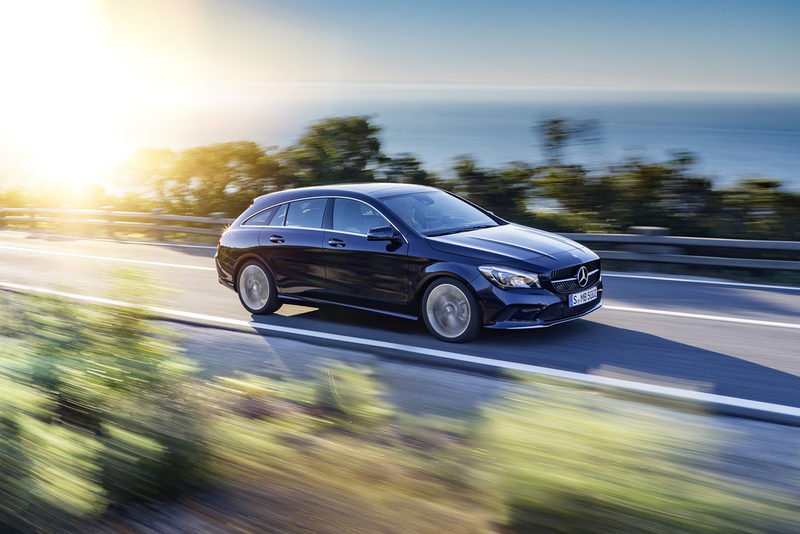 New to the range of engines for the CLA Shooting Brake is the ‘efficiency champion’ 180 d BlueEFFICIENCY Edition, with an output of 109 hp and CO2 emissions from 89 g/km. With a peak performance of 381 hp and maximum torque of 475 Nm, the Mercedes-AMG CLA 45 4MATIC Coupe and Shooting Brake are among the most powerful vehicles in their segment, accelerating from rest to 62mph in 4.2 or (4.3 seconds for the Shooting Brake). At the same time, fuel consumption comes in a 40.9mpg (NEDC combined). 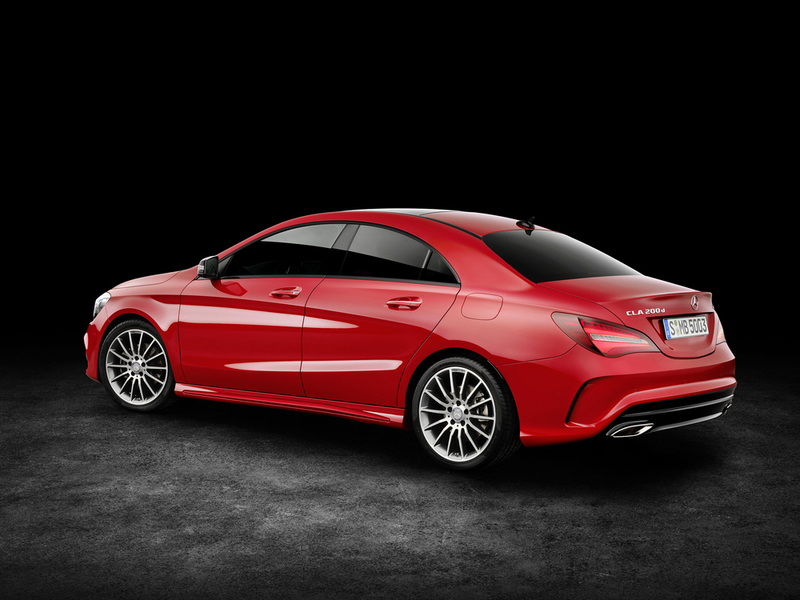 The facelifted CLA Coupe will make its debut at the New York International Auto Show (25 March to 3 April 2016), while the modified CLA Shooting Brake will be launched to the public at the Laureus World Sports Awards in Berlin on 17/18 April 2016. Both models will be available to order from April with pricing yet to be announced.